SUBHEAD: Elizabeth Warren agreed with Trump on China, now Bernie Sanders agrees with him about Amazon. 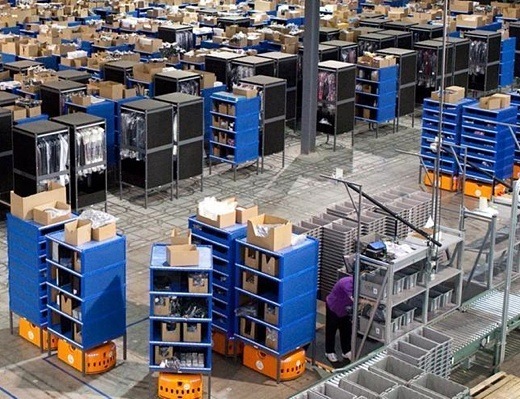 Image above: Kiva’s squat orange robots, which pick and move merchandise for Amazon could prove essential to helping Amazon return to profitability. From (https://www.bostonglobe.com/business/2013/12/01/will-amazon-owned-robot-maker-sell-tailer-rivals/FON7bVNKvfzS2sHnBHzfLM/story.html). Yes, Apple too. But they make real things! Yes, but just as Apple CEO Tim Cook seeks to distance his company from the likes of Facebook on morals and ethics, he can’t deny that Apple sells a zillion phones to a large extent because everybody uses them to look at Facebook and Alphabet apps until their faces are blue. If data ethics are the only problem Cook sees, he’s in trouble. Trump can’t act fast enough on the tax situation and the US Postal deal. Not that that will solve the issue. Amazon, like all the companies on my list, can only be cut down to size if and when the everything bubble is. They are, after all, its children. Their place in the list is obvious. What is it, 2.5 billion users? And what they don’t have is divvied up between them and Google when they buy up apps like Instagram. Officially competitors, but they have the exact same goals. And, like me, you may think: what’s the problem, just ban them from collecting all that data. Facebook has no reason to know, at least not one that serves us, where you were last Friday, and with whom. And just in case you missed that bit, they do. Largely the same set of issues that Facebook has. Its tentacles are everywhere. Former CEO Eric Schmidt’s connections to the Pentagon should be really all you need to know. The EU may have issued all sorts of complaints and fines on competition grounds, but that makes no difference. Elon Musk has built a fantasy (and maybe I should put Paypal in this list too) on what everyone thinks must be done to ‘save the planet’ (yeah, build cars…) by grossly overstating the number of cars he can build, and financing his growth on not only speculation, but also on spectacular amounts of government subsidies (politicians want to save the planet, too). Why anyone anywhere would want to send money generated in their community, by renting out cars and apartments in that same community, to a bunch of people in Silicon Valley, is beyond me. Someone should set this up as an international effort that makes it easy for a community, a city etc., to provide this kind of service and make the profits benefit their own cities. Less obvious perhaps as an entry in the Big Tech list, but very much warranting a spot. And of course it stands for the entire chemical-seeds field. From Agent Orange to your children’s dinner plate. Monsanto has more lawyers and lobbyists on its payroll than it has scientists, but then its lofty goals outdo even those of Google or Amazon.